It was a tough match for but teams as Newcastle and Chelsea looks unconquerable, no one wants to loose. Rafael Benitez men and Maurizio Sarri's men where able to hold on to a goalless draw throughout the first half. Rafael Benitez (Newcastle manager) was brilliant enough to make it tough formation for the blues as he deployed 5 defenders, 4 midfielders that never relent in defending this automatically paralyzed their attacking abilities which lead to more defence few attacks. 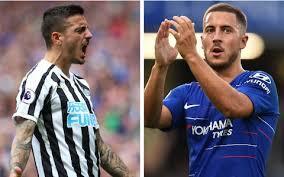 Eden Hazard opened the scoring for the blues with a penalty kick on the 76th minutes which kept the blues on a better side for eight minutes before Joselu who substituted Solomon Rodon on the 62nd minutes scored an equalizing goal for Newcastle with a brilliant header which was assisted by DeAndre Yedlin in 83rd minutes. The winning goal was the handiwork of Marcos Alonso's shot which deflected off DeAndre Yedlin. Newcastle seems to be more defensive as Chelsea dominated by 82% ball possessions while Newcastle has 18% possessions. This is Chelsea's third straight win in this year's premier league which placed them among Liverpool and Watford who so far also have three straight win with 9 points. When sarri was asked what it meant to be on top of the table he replied "it means nothing, the league table is not important it was just important to start the season well". Bournemouth will meet Chelsea on Saturday 1st September for their next game while Newcastle will play their next match with Manchester City on 1st of September. Always visit 👉 www.sportsdine.com for your sports updates and betting tips.